As the wars in Afghanistan and Iraq rage on and tensions boil over in the rest of the Middle East, Ryan Crocker, former U.S. ambassador to that region, will present a lecture, "A New Foreign Policy? Lessons from Iraq," on Wednesday, Oct. 21, at 7 p.m. in the Robinson Teaching Theatre in Weyerhaeuser Hall at Whitworth University. On Thursday, Oct. 22, Whitworth Academic Dean Michael Le Roy will lead Whitworth faculty members in a panel discussion about U.S. foreign policy opportunities and challenges in the Middle East. The panel will include Professor of Sociology Raja Tanas, Associate Professor of Sociology Jennifer Holsinger, Professor of Political Science John Yoder, and Professor of History Dale Soden. The discussion will take place at 7 p.m. in the Robinson Teaching Theatre in Weyerhaeuser Hall. Admission to both events is free. For more information, please call (509) 777-4263. Crocker, a Spokane Valley native, recently retired from a 30-year career in the U.S. Foreign Service that included appointments as the U.S. ambassador to Iraq (2007-09), Pakistan (2004-07) and Afghanistan (2002-04). His accomplishments earned him the Medal of Freedom, the Presidential Distinguished Service Award and the State Department Award for Valor. When President George W. Bush awarded Crocker the Medal of Freedom, he called him America's Lawrence of Arabia for his deft handling of U.S. diplomatic relations in that tumultuous part of the world. Prior to that, Bush also conferred on him the personal rank of Career Ambassador, the highest position in the Foreign Service. "Ryan Crocker combines a profound commitment to the best of American values with a broad knowledge of history, strong language and cultural skills, and a sophisticated understanding of non-Western political systems," Professor Yoder says. "He will draw on his experiences in the Middle East to help the audience understand the guiding principles of a sound foreign policy." Crocker grew up in an Air Force family, attending schools in the U.S., Morocco, Canada and Turkey. He holds a B.A. in English and an honorary doctor of laws degree from Whitman College, in Walla Walla, Wash. Since joining the Foreign Service, in 1971, he has had assignments in countries such as Iran, Qatar and Egypt. He was assigned to the American embassy in Beirut during the Israeli invasion of Lebanon in 1982 and the bombings of the U.S. embassy and military barracks in 1983. 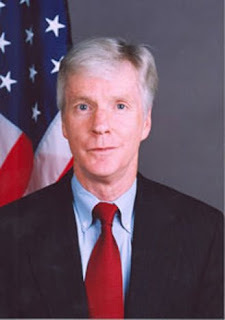 He served as deputy assistant secretary of state for near Eastern affairs from 2001-03. In 2003, he joined the faculty of the National War College, where he was the international affairs advisor.